When looking for an affordable pair of binoculars, let's say under £200, choosing from the hundreds of pairs available can seem a bit daunting. 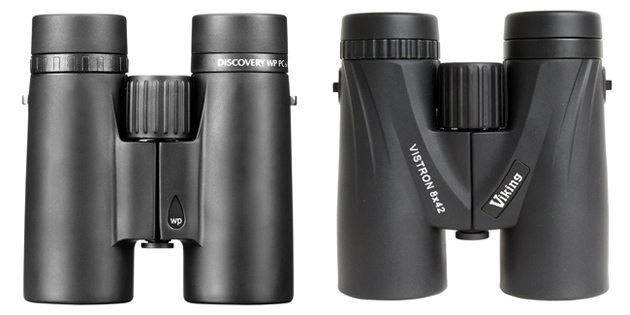 Two of the top contenders, however, are the Opticron Discovery and the Viking Vistrons. Both brands are known for offering inexpensive instruments packed with features of some higher price binoculars. 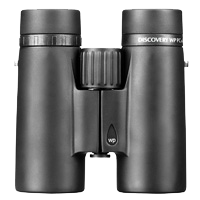 The Discovery 8x42s and Vistron 8x42s retail for £179 and £209 respectively (correct as of 1st October 2012), though if you take the time to shop around you can pick either pair up for around the £150 mark. The question is, then, how do they compare? Physically, these two are incredibly similar. Both are around 134mm high x 126mm wide, which is pretty small for a 42mm objective lens binocular. The Viking Vistons are slightly lighter, however, at 650g versus around 700g for the Opticron Discoveries. Both models offer retractable eye cups and the click-stop dioptre adjuster is virtually the same on each pair too. Ultimately, if you like the feel of one of these, you'll like the feel of the other. More importantly, though, is which one performs better. The field of view on the Dicovery 8x42s is 7.5° whereas the Vistron's fall behind at 7°. Though it may not seem a significant difference, if you look at the figures as a distance at 1000m (Click here to see our Field of View Conversion Chart) you get an image almost 9 metres wider. Certainly a noticeable increase when comparing the two in the field test as 'track-and-trace' watching was far easier with the Discoveries. They also produce a brighter, crisper and more vivid image than the Vistrons. Perhaps not a huge difference in daylight but during testing in overcast conditions I could pick up more detail in shadowed areas with better contrast too. Drop off in sharpness at the edges was similar on both, personally I wouldn't complain at either with the centre sweet spot being plenty big enough. Opticron state their model will focus down to 1.5m whereas Viking say their minimum is 2m. In tests I could in fact get slightly closer with the Viking Vistrons, a huge surprise given the specs! Both were closer to about 1.3m rather than those mentioned, which is more than useful for close up wildlife watching. Each brand supplies their model in a soft case with rainguard, wide lanyard and objective lens caps. Both also provide a 5 year guarantee to cover any manufacturing defects. A tough choice if these two are top of your wish list, choosing between them may simply come down to the best deal at the time. Optically, I personally found the Opticron Discoveries were the better of the two though both models are built and feel incredibly similar to hold with the Vistrons appreciably lighter. They include very similar accessories too. I'd always say trying before you buy is the best option and would think it would be hugely beneficial with these two pairs to get a good feel of each first. With weight not a big issue for me yet optical quality top of my agenga, the Discovery 8x42s would be my choice.